PHOENIX – “I don’t envy myself for going through that,” ultra-runner Michael Versteeg said with a laugh. “That” would be his successful attempt at completing the 800-mile Arizona Trail, which stretches from Utah down to Mexico, faster than it has ever been done on foot. While most in Arizona were fast asleep on the morning of Oct. 19, Versteeg, 31, was shattering a record at the Arizona-Mexico border. 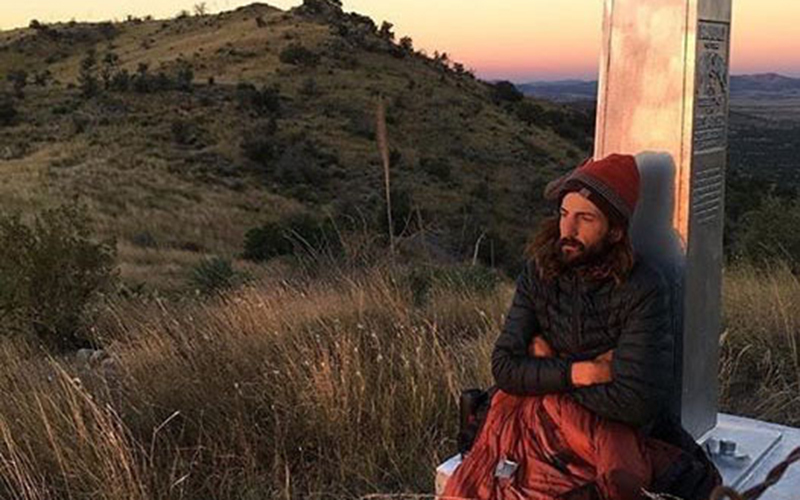 At 4:41 a.m. that day, he completed the Arizona Trail after 15 days, 22 hours, 39 minutes, besting the previous fastest known time of 21 days, 14 hours, 16 minutes set by Adam Bradley in 2011. While Versteeg, who lives in Prescott, has competed in many ultra-running events, he said this was different from anything he has done. “In some ways I feel like this is the first truly endurance thing I’ve ever done,” Versteeg said. Paco Cantu, a childhood friend of Versteeg’s who helped as part of his support crew on the last few days of the Arizona Trail, said that their long friendship made seeing Versteeg accomplish his goal even better. Matthew Nelson, executive director of the Arizona Trail Association, was skeptical that Versteeg would be able to complete it and break the record. But after seeing his result, there wasn’t much to say. While Versteeg said he didn’t have too much of an emotional reaction upon completion, simply because of how drained he was from the experience, later on he was able to express how he felt about his accomplishment. Versteeg began his 800-mile odyssey at the Arizona-Utah border on the morning of Oct. 3 and looked to keep up a 50-mile-per-day pace throughout. Nelson has seen many people attempt the Arizona Trail over the years, along with some that thought they could top Bradley’s record. While most say they’ll do 50 miles a day, in his experience, it never lasts. “Generally the Arizona Trail has not been thought of as something that could be run,” Versteeg said. Cantu said that he’s run races with Versteeg and crewed for him in other events, and was surprised at how he held up in an undertaking like this. No matter what happened out on the trail, Versteeg said that all his focus remained on getting that 50 miles a day. Without that, he’s wasn’t sure if he could’ve done it. Versteeg’s decision to go from north to south afforded him what Nelson said is widely considered the easier parts of the trail first. That’s also how he was able to hit more than 50 miles a day for much of that section. It was in the Sky Island ranges, which are strung together in southern Arizona, that Nelson believed Versteeg could get tripped up. Versteeg noted that the trail also becomes much less structured once you get into the southern part. While the mountains may sound tough, and would be for many people, Versteeg said that it was the overgrown grass that had taken hold of the southern leg of the trail that was the worst part of the experience. His feet were just as bad, and eventually he turned to an unconventional solution to the problem. Even his solution created new issues and didn’t prevent all of the original problems. The result was swelling, blisters and more of the allergic reaction. “My feet just totally fell apart the last few days,” he said. Nelson said that the grasses are a natural part of what happens to the trail after the summer rains. However, he said that the rain this year caused the grass to be worse than usual. Cantu could tell just how badly the grass was affecting Versteeg. “I can’t overemphasize that enough – how terrible the grass was,” Versteeg said. Versteeg was the one who actually ran the whole thing, but he admitted that it would have been much tougher without his crew. Versteeg said that he didn’t have one group of people that were with him the whole time. Instead, there would be different groups that would take over at certain points. Overall he said there were about 12 people who joined him at some point along the way as crew. Versteeg’s accomplishment will be recognized as the fastest known time for supported passage of the trail. And while he was making his attempt, Heather Anderson of Edmonds, Washington, also was on the Arizona Trail, breaking Bradley’s self-supported fastest known time by traversing the trail without a crew in 19 days, 17 hours and nine minutes. Cantu said the main responsibility of a Versteeg’s support crew was to intercept him on the trail and make sure he had what he needed for each leg. Versteeg said the support was invaluable. Versteeg said that he went through around 30 pairs of socks on the trek. His feet were a major concern for the crew. The crew joined Versteeg for the final 1.8 miles of the trail, which extends from the last trailhead to the actual border with Mexico. When they got to the border, he was happy to share the experience with the others. “We all gave each other hugs and congratulated each other and it was a great moment,” Versteeg said. He couldn’t overstate what the crew meant to him and how much they helped him out. While some may have doubted that Versteeg would be able to break the record, he said that he knew early on that the pace he had been doing afforded him ample time to do it. “Halfway through this thing we had figured out I could’ve run 30 miles a day at the second half of it and still broke the record,” Versteeg said. Instead, his main focus was on his personal goal of completing the Arizona Trail in around 16 days, meaning maintaining a 50-mile-a-day pace the whole time. For anyone who wanted to follow along with Versteeg as he tried to break the record, he wore a SPOT tracker, a GPS device that pinpointed his location every few minutes and sent it to a tracking website. As for his new record, Nelson, Cantu and Versteeg all think it could be broken – eventually. Cantu said he wouldn’t be surprised if it was Versteeg himself that broke his own record. Versteeg said that he is interested to see people come out and attempt to top him. Nelson’s only concern is that some people might attempt it without being as prepared as Versteeg was for what the Arizona Trail entails. The Arizona Trail might have been the most difficult thing Versteeg has done, but he wasn’t necessarily clamoring for it to be updated and improved. Nelson said that the Arizona Trail Association is always looking at projects to improve the trail and make it sustainable. However, that doesn’t mean they’re looking to take away the spirit of the trail. “The beauty of where this trail goes, and what it is, is that it puts you at pretty remote, wild places,” Nelson said. “The more amenities, the more signs, the more reminders of human impact there are, the less I feel like you get a wilderness experience. After his experience, Versteeg said the Arizona Trail is something completely different from some of the other well-known long distance trails in the United States.